Passport Club (PC) is off to a great start! 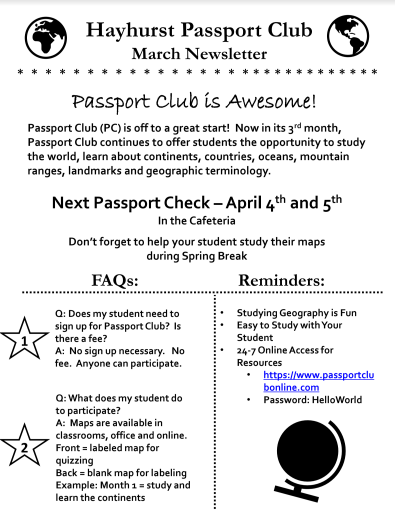 Now in its 3rd month, Passport Club continues to offer students the opportunity to study the world, learn about continents, countries, oceans, mountain ranges, landmarks and geographic terminology. Don’t forget to help your student study their maps. For some passport club games, click here. No sign up necessary and there is no fee. Practice maps are available at the school office and online. Check out the March Newsletter here.